It was a National Football League first on August 16, 1976 when the San Diego Chargers and St. Louis Cardinals met for a preseason game in Tokyo, Japan. While NFL contests had been played in Canada, never before had one occurred outside of North America. The game was referred to as the Mainichi Star Bowl since it was jointly sponsored by the Mainichi Newspaper Company and the Sports Nippon Newspaper Company as part of the United States Bicentennial celebration. Many citizens of the city of Suwa in central Japan, which had engaged in several cultural exchanges with St. Louis, were at the game, led by Mayor Setsuji Iwamoto. Four firemen played Japanese army assault marches on their bugles while another citizen of the city banged on a drum. “They are such nice people, and they respond very quickly to our action,” said Lori West, a University of Missouri student and cheerleader for the Cardinals. As for the participants on the field, it was the third preseason game for each club. The Cardinals, coached by Don Coryell for the fourth year, were coming off of consecutive NFC East titles and had been 11-3 in 1975. San Diego was a less successful club under the direction of Head Coach Tommy Prothro and posted a 2-12 record the previous year, its sixth straight losing season. In a rebuilding mode, the Chargers hired Bill Walsh away from Cincinnati to be offensive coordinator and especially to provide guidance for young QB Dan Fouts. Neither team generated much of a ground attack in the early going. In the first quarter, Jim Bakken kicked a 30-yard field goal for the Cards and, in the second quarter, St. Louis again moved into scoring position thanks to a nine-yard carry by HB Jerry Latin and a run by HB Wayne Morris that picked up five for a first down at the San Diego 15. From there, QB Bill Donckers threw a touchdown pass to WR Pat Tilley and Bakken converted to put the Cards up by 10-0. San Diego finally got on the board with four seconds left in the first half as Sergio Albert booted a 30-yard field goal. In the third quarter, a bad punt by a heavily-rushed Terry Joyce of the Cards, kicking from his own end zone, gave the Chargers possession at the St. Louis 28. Dan Fouts tossed a four-yard completion to WR Charlie Joiner before throwing a 23-yard TD pass to WR Dwight McDonald and Albert added the extra point that tied the contest at 10-10. The Cardinals came right back as Jim Hart went long to WR Ike Harris in a play that covered 52 yards for a touchdown. Bakken closed out the scoring with a 10-yard field goal in the fourth quarter and St. Louis won by a final tally of 20-10. The game was pass-heavy, with the Cards running 41 times for 105 yards and San Diego gaining just 34 yards on 19 attempts. St. Louis had 20 first downs to 12 for the Chargers. Bill Donckers and Jim Hart both threw 14 passes apiece for the Cardinals, with Donckers, the backup, completing 10 for 94 yards and a touchdown and Hart 9 for 111 yards and a TD. Neither was intercepted. Wayne Morris gained 49 yards on 14 carries and Pat Tilley caught 4 passes for 54 yards. For the Chargers, Dan Fouts completed just 4 of 10 passes for 70 yards while backup Jesse Freitas was successful on 9 of 20 for 85 yards and was intercepted once. FB Jim Harrison had 28 yards on 6 carries to pace the club in rushing. Dwight McDonald caught two passes for 44 yards and a TD. In the regular season, St. Louis put together a 10-4 record but just missed the playoffs this time, ending up third in the NFC East. The Chargers improved to 6-8 and third in the AFC West. As a side note, Bill Walsh stayed for a year with the Chargers before departing for Stanford, and Dan Fouts, who showed much improvement under Walsh’s guidance, would go on to Hall of Fame success after Don Coryell left the Cards and came to San Diego to replace Tommy Prothro. As for the NFL playing outside of North America, the next overseas preseason game occurred in London, UK in 1983, and London would become a regular host to preseason and, eventually, regular season contests. 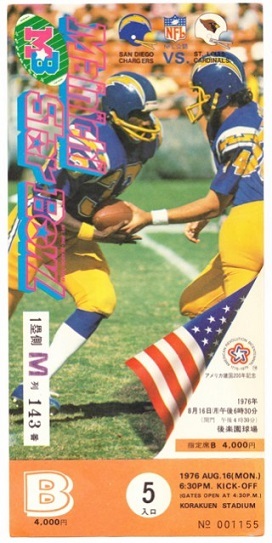 The NFL would also return to Tokyo, but not until 1989, and for preseason games only.